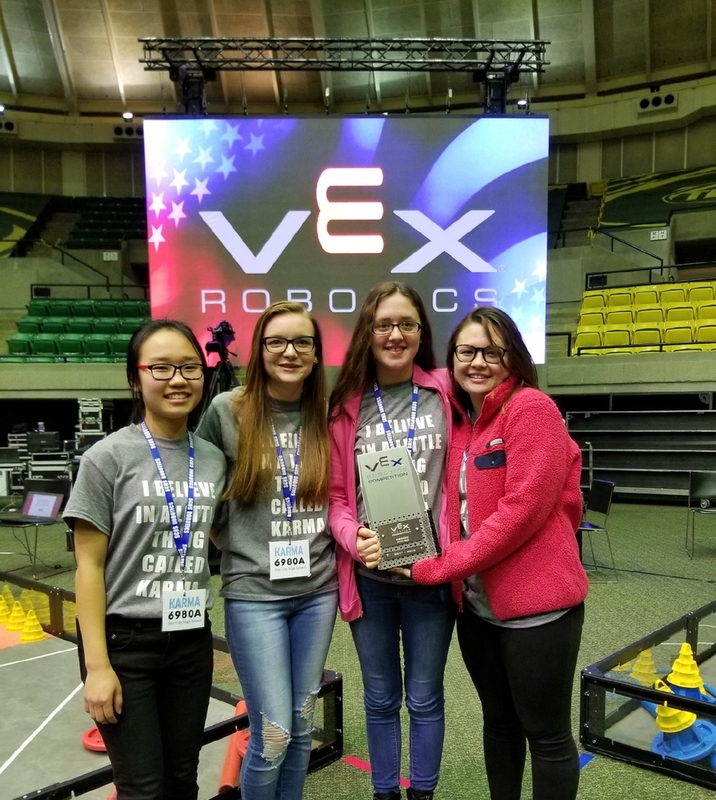 KARMA is Star City High School’s all-girl Robotics team, which consists of Kaylin Parker, Karley Spivey, Jamie Chen, and Tayler Donaldson. During Robotics competition season, this team won the Design Award at five tournaments, including the AR State Competition. Winning the award on the state level advanced them to the VEX Worlds Robotics Competition in Louisville, KY, April 25th-28th. They will compete with every Design Award winner from every state and teams from other countries, including Japan, China, Canada, Thailand, Mexico, UK, Australia, Puerto Rico, New Zealand, Philippines, Hong Kong, Malaysia, Taiwan, Bahrain, Colombia, South Korea, Singapore, Spain, Turkey, Guatemala, Brazil, Germany, Ireland, and Chile. There will be 498 teams from around the world competing during these four days in April. We have no idea how many teams will be competing for the Design Award, but KARMA will also be competing in the arena, as well. The following criteria must be met in order to win the Design Award. The Design Award is presented to a team that demonstrates an organized and professional approach to the design process, project and time management and team organization. Only teams that submit Engineering Notebooks are eligible for the Design Award. KARMA is one of the top 10% teams which is eligible for the VEX Worlds Design Award. How awesome is that? On their Evaluation form from the state competition, the head judge (who happens to be an engineer) wrote, “This engineering notebook deserves the Worlds Design Award”. He also told the Arkansas VEX Affiliate he would hire any of these young ladies as interns before they enter college. They know the design process and they use it to the fullest extent.